Inheritance, Heritage and Memory in the Lee Valley is my new book. It is based on the series of articles that featured in the Cork Independent newspaper from October 2007 to June 2009. It documents my explorations in the parishes of Aghabullogue, Inniscarra and Ovens on the northern valleyside on Inniscarra Reservoir, part of the course of the River Lee. Unearthing the concepts of place-making play a huge part in my journey. I like the idea of culture not as something static but as something living, a process driving people and informing the decisions of the present. I have developed interests in ideas of legacy and how certain things are selected to be remembered and others disappear. In the Lee Valley I have marvelled at how the landscape has been transformed through ventures such as the Lee Hydroelectric and how it affected the population in terms of uprooting people, providing huge employment to the Cork region and creating new attitudes, mindsets and huge debates amidst communities, challenging them to change with the times. Then there is that notion of time. I marvel at the old black and white photographs showing families from 100 years ago and then marvel at the person showing me the photograph, who is the present day representative. The collision of the old and the new can be witnessed across the valley. Sometimes the contrasts are worrying but at other times, without them, the sense of living communities would be redundant. One aspect for certain is that the more I researched the places within the region or the more doors I knocked on, the more information came to the fore. What is also apparent is that everybody’s view of the world is different. It could be an insider’s view or an outsider’s view, such as my own. For most people I met, heritage was a personal and collective experience focusing on their own roots. In fact, the historical data played ‘second fiddle’ to their personal stories. It has been interesting to see how stories and values have been handed down, and how each successive generation has taken it in turn to hold a torch for some element of the past in the present. One recurring aspect is how much the region’s cultural heritage runs metaphorically in ‘people’s blood’. There were a large number of people who noted, ‘my father used to say’ or ‘my mother used to say’. That sense of inheritance is important and it is more than just honouring people. It conjures up debates about achievement and loss, and it is more than just recalling the memory of a few. For each person interviewed many more are represented through their life experiences. One is allowed to ponder on the power of the individual and their contribution to society, whether at a local or international level. The evolution of ideas can be mapped. The majority of the participants were met whilst traversing the parishes. Generally speaking, information in a library or on a map does not give you the tools for researching people and their attachment to place. 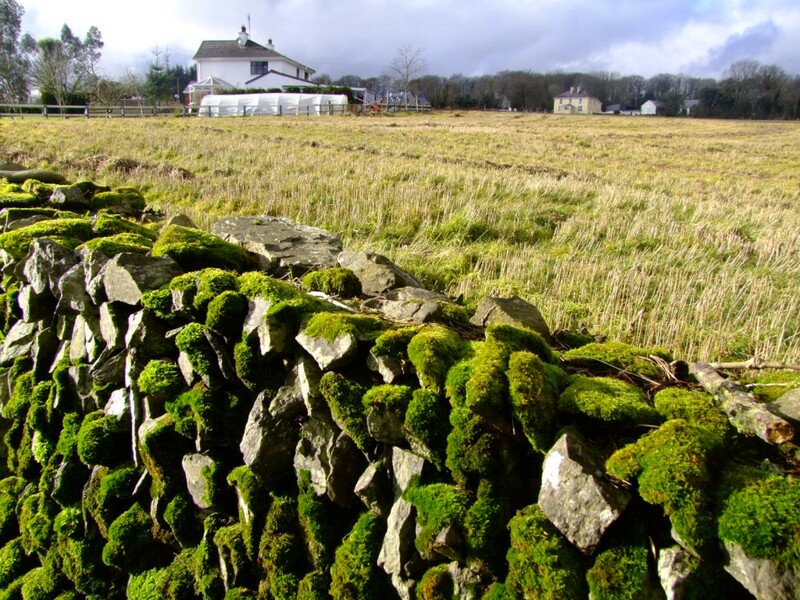 Through fieldwork and talking to people, you can see that a community such as that in Aghabullogue parish or any other parish in Ireland evolved from leadership offered by individuals and families. People brought their own ideas and talents in forging a family space, which is then set in the wider community. It is interesting to note how the talents of a few can make a place or indeed reawaken one that is in decay. Some people’s stories, especially in Aghabullogue parish, began elsewhere. In particular, the commercial possibilities of the region inspired many entrepreneurs and artisan families who settled in the region through the ages. So, Inheritance dabbles in the architecture of heritage and its interaction with life in the River Lee Valley. It does focus on a section of the Lee Valley, namely Aghabullogue, Inniscarra and Ovens parishes, but is not a definitive history of those regions. For me, the essence of the book is focussed on the beauty and structure of ordinary ‘things’ that one may take for granted but which highlight, debate and celebrate our cultural heritage. This book is about a journey in seeking out the sense of place in the Lee Valley, a valley that has grasped my imagination and fails to let go. I have laughed, cried, wondered, been awestruck and got excited by my findings. The Lee Valley as a place has inspired in me a whole series of reactions. With all that in mind, Inheritance attempts to capture my explorations, the many moods and colours of a section of the River Lee Valley, to contemplate new ways of seeing, to rediscover the characters who have interacted with it, the major events and the minor common happenings and to construct a rich and vivid mosaic of life by and on the River Lee. Above all this book is not what we have lost but what we have yet to find. The above text is abstracted from the introduction to Kieran McCarthy’s Inheritance, Heritage and Memory in the Lee Valley, Co. Cork. 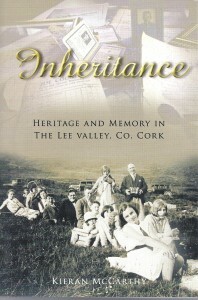 The book is available from any good Cork bookshop.